Pack scoops of ice cream, alternating flavors, in pie crust. Cover and freeze about 2 hours or until firm. Heat oven to 475°F. In medium bowl, beat egg whites and cream of tartar with electric mixer on high speed until foamy. Beat in sugar, 1 tablespoon at a time; continue beating until stiff and glossy. Do not underbeat. Beat in vanilla. Spoon meringue onto ice cream; spread gently, sealing meringue to edge of crust. Bake 2 to 4 minutes or until top is light brown. Serve immediately, or cover and freeze no longer than 48 hours. Store in freezer. Adding sugar gradually to the egg white foam helps stabilize the meringue. Use Betty Crocker® pie crust mix instead of the scratch pastry in this recipe and save time. Go ahead and play with your favorite ice cream flavors. Why not chocolate, chocolate-chip mint and vanilla for Baked Alaska Grasshopper Pie? 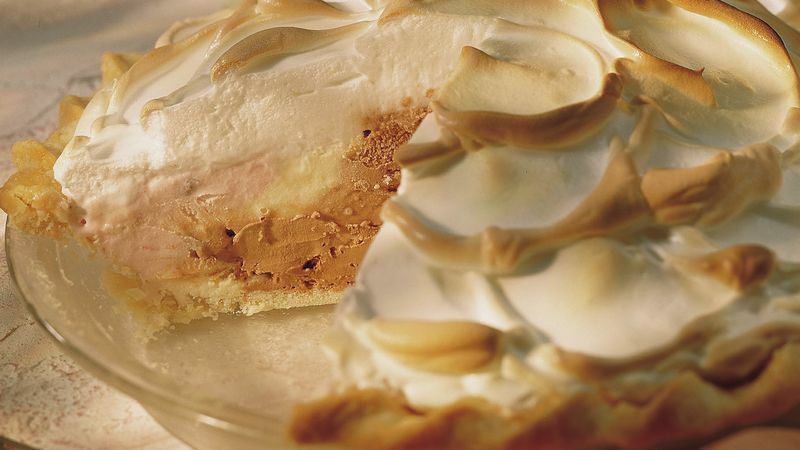 Or chocolate, coffee and vanilla for Baked Alaska Cappuccino Pie?